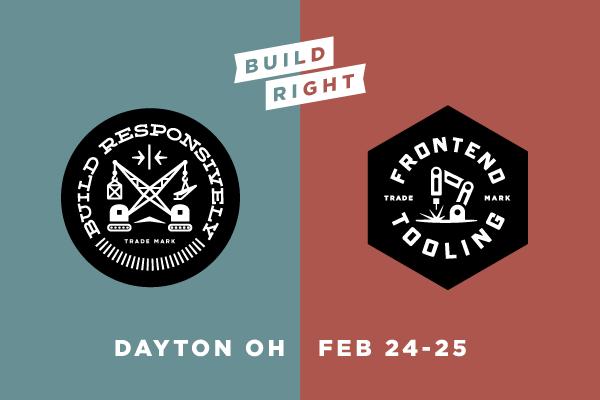 Be the first to attend the 2014 Build Responsively workshop and our brand new workshop, Frontend Tooling, before all the other cool kids do. Join us at our office in Dayton, OH February 24 and 25. Come for the great workshops and brilliant conversation. Stay for the delicious food and a homemade tequila sour from our favorite local bartender. We’re making good on our promise of awesome, new workshops, and now’s your chance to be the first to attend them before all the other cool kids do. Sparkbox is hosting a two-day Build Right workshop event with the 2014 Build Responsively and (for the first-time ever) Frontend Tooling. Register Now. Space is limited, so sign up fast! Images, Video, Tables, Layout, Type, etc. The Build Right Frontend Tooling workshop will help you eliminate development pain and friction by introducing you to modern development processes and tools. Combine these great workshops with brilliant conversation, delicious food, and one homemade tequila sour from our favorite local bartender, and you’ll be a Build Right believer! Sign up by February 4 and get the special earlybird rate.